A BRAY SCHOOLBOY whose fight to remain in the country of his birth got national attention has been told that he faces no immediate threat of deportation. Nearly 60,000 people have signed a petition calling for 4th class pupil Eric Zhi Ying Mei Xue to stay in Ireland. 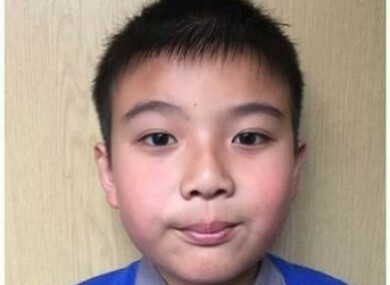 Eric, who is nine years old, was born in Ireland, but he is not a citizen and he is now facing deportation to China. Leena Mei Mei Xue, Eric’s mother, arrived in Ireland 12 years ago. However, a deportation order was served against her in 2015. She has appealed the order over the last three years, however, her last appeal was rejected in June. On the petition site, the school states that Eric is neither an Irish citizen nor a Chinese citizen. They are concerned that if he returns to China, he will have no access to the country’s health or education system because he is not a Chinese citizen. Speaking today on the Last Word with Matt Cooper, Health minister Simon Harris said he had received some “good news” from the Department of Justice. Harris is the family’s local TD. Email “'No immediate threat of deportation': Bray schoolboy's case to be reviewed ”. Feedback on “'No immediate threat of deportation': Bray schoolboy's case to be reviewed ”.